Hello friends,Welcome to Hackers Zone.Today I am posting such an interesting article here. Do you ever feel yourself tensed ,alone,depressive.And you need someone with whom you can share your problem.You need some company to hold you. What if that someone is none other than 'GOD'. If you really feel like you need to talk about something but you don’t have anybody with whom you can talk right now then its best that you chat with GOD and share your emotions or problems.You can make confessions which will make you feel lighter and better. Here I'm giving you a site on which you can chat with directly to the GOD and I'm sure you'll really feel relaxing.As I'm already chating from past few days. The reply you get from God is very accurate.It is really great to spend time when you feel lonely. 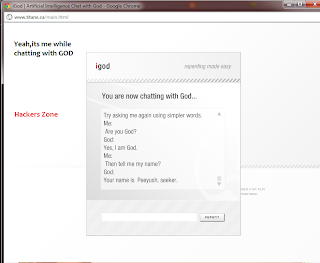 So,Where you can Chat with God? 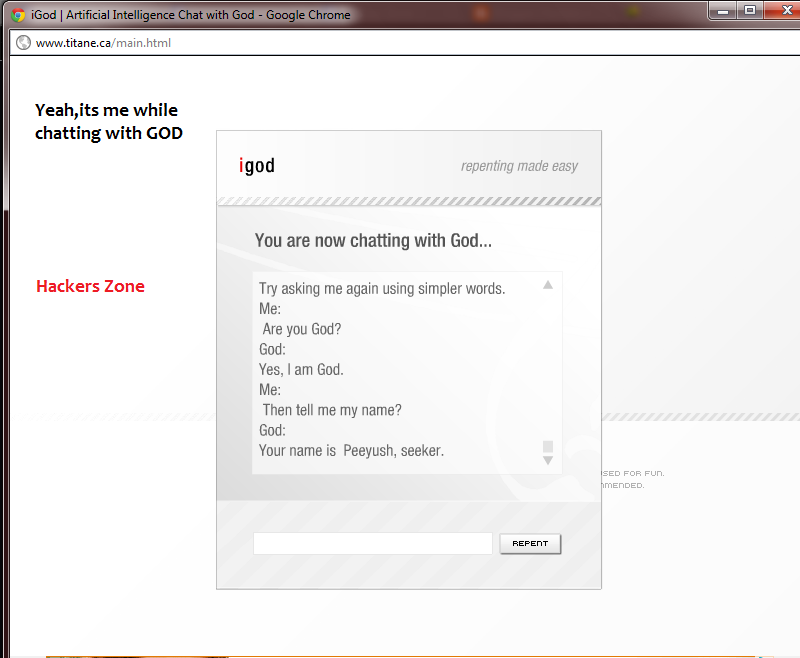 You can chat with God here. On there homepage click on the Enter button at right-bottom corner of the screen. If not then refresh again. Now a new popup window will open asking you to select a skin for Chat Window. After selecting click on Sign In button you are ready to chat with God. You will really feel the conversation to be quite interesting as you would not be the only who would be sharing his problems with God but you will also see God sharing emotions and problems with you.